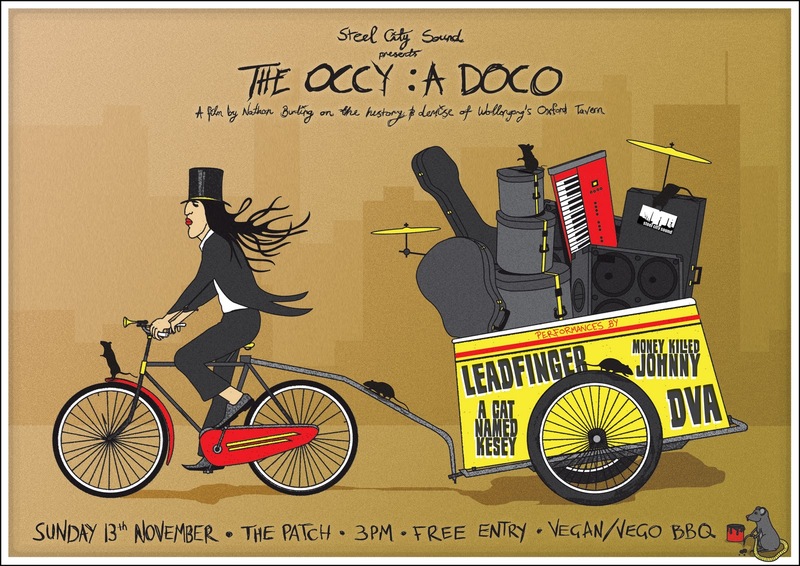 Steel City Sound is proud to present a FREE screening of Nathan Burling's 'The Occy - A Doco' along with local tunes from those closely associated with the Occy's past: Leadfinger, Money Killed Johnny, A Cat Named Kesey and DVA Swinging Beef & The Daptoids, on Sunday, Novemeber 13 2011 at The Patch (Cabbage Tree Hotel, Fairy Meadow). Wollongong’s Oxford Tavern was a live music venue for over 30 years. Arguably, its heyday was in the nineties under the music co-ordination of local musician Steven Robinson. Throughout the nineties it became the hub of local original music as well as meeting place of likeminded artists, activists and students. It was Wollongong’s little slice of bohemia. However, in the mid naughties, there were rumours the Oxford was to be bought and that it would no longer continue as a venue for live music. Many in the music community were concerned this would be the end of the live music scene. Former Nabilone vocalist and guitarist Nathan Burling was one of them. In 2006, as part of the Master of Journalism course Burling was enrolled in at UOW, he decided to interview stakeholders in the Oxford Tavern: bookers, bands, punters and staff were all interviewed and asked about the potential demise of our beloved Oxford. In 2007, the sale went through. The Belmorgan Group bought the Oxford and the new owners claimed nothing would change in regards to live music. However, it did change. “The Occy” is the story of the end of a venue and the rise of a new music scene. I congratulate them for reaching 30 years in the industry, commendable indeed!